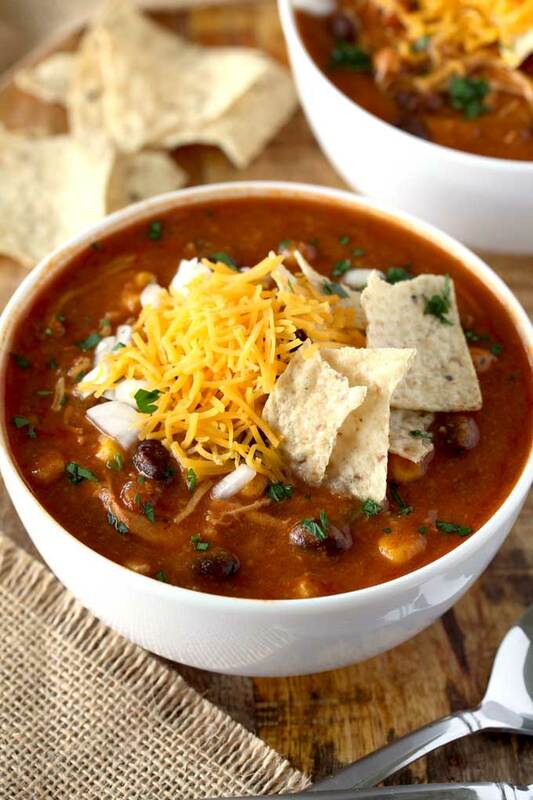 This Chicken Enchilada Soup is loaded with shredded chicken, black beans and corn and topped with your favorite fixings! This creamy, cheesy and hearty Enchilada Soup is made entirely in the slow cooker! 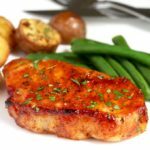 I love quick and easy dinner recipes, especially the ones that only take a few minutes to prep. 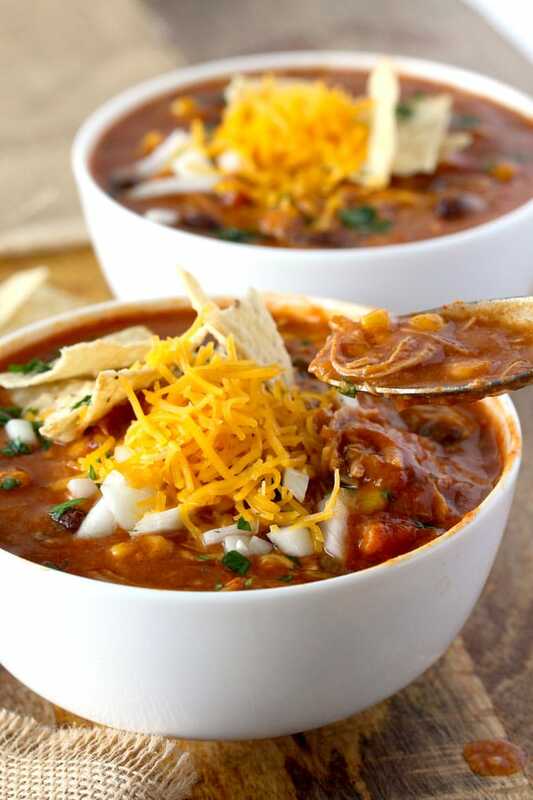 This Slow Cooker Chicken Enchilada Soup is the perfect hearty meal for a busy weeknight. 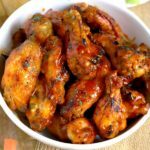 Just dump all the ingredients into your crock pot and let it do it’s magic! A delicious dinner will be waiting for you after a long and busy day. 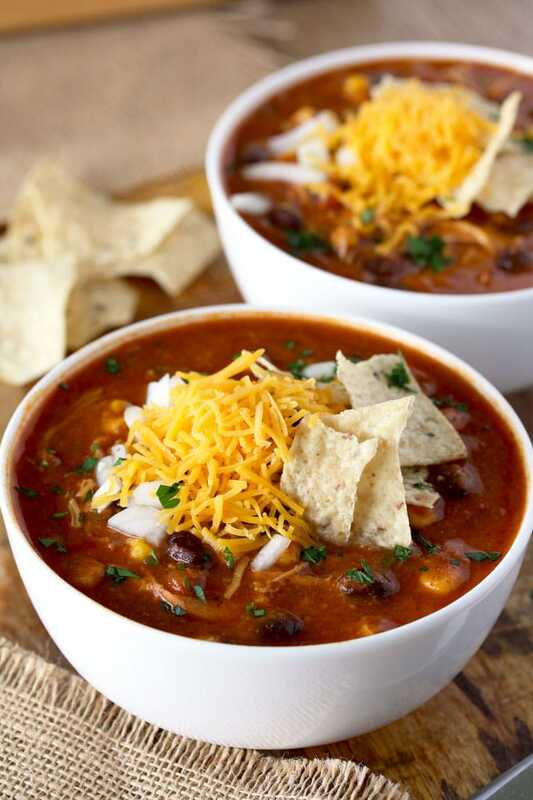 Many years ago, my husband introduced me to Chili’s Chicken Enchilada Soup. I must admit, I was hooked immediately. 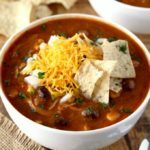 This easy crock pot soup is my homemade version of the famous Chili’s soup. 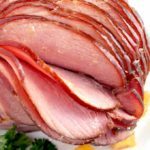 It has all the same delicious flavors but is made without the processed cheese! That to me is a big plus! This easy chicken soup recipe is super tasty, a bit spicy and gets its rich and thick consistency from the use of Masa Harina. Masa is a soft flour made from ground dried corn that has been cooked and soaked in a diluted solution of “limewater” (calcium hydroxide). This alkaline solution is what gives masa it’s distinct light sour flavor. Masa is the main ingredient in corn tortillas and tamales. You can find Masa harina in most supermarkets these days. This one is the one I usually buy at my local supermarket. If you cannot find masa harina, use corn tortillas instead. Add corn tortillas into a food processor and break them down as finely as possible. Just like in this Chicken Tortilla Soup, they will dissolve in the soup adding the most delicious authentic Mexican flavor and a rich thickness to the soup. To make this simple Mexican Chicken Soup, whisk the masa harina and water in a small bowl. Try to get rid of all the lumps. This will guarantee a smooth and creamy soup. 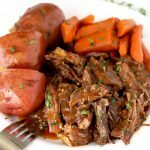 Place the rest of the ingredients in the slow cooker. Add the masa harina mixture and stir to combine. Cook on LOW for 6 to 8 hours or on HIGH for 4 hours. 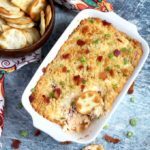 Shred the chicken with two forks and serve! Try not to skip on the toppings! They always make dinner tastier and fun! I use Mild Enchilada Sauce for this easy soup recipe. Although we love spicy foods, I find the medium and spicy enchilada sauce to be way too spicy for our taste. 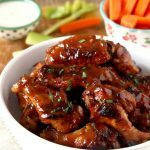 Need quick and easy dinner ideas made in the crock pot? 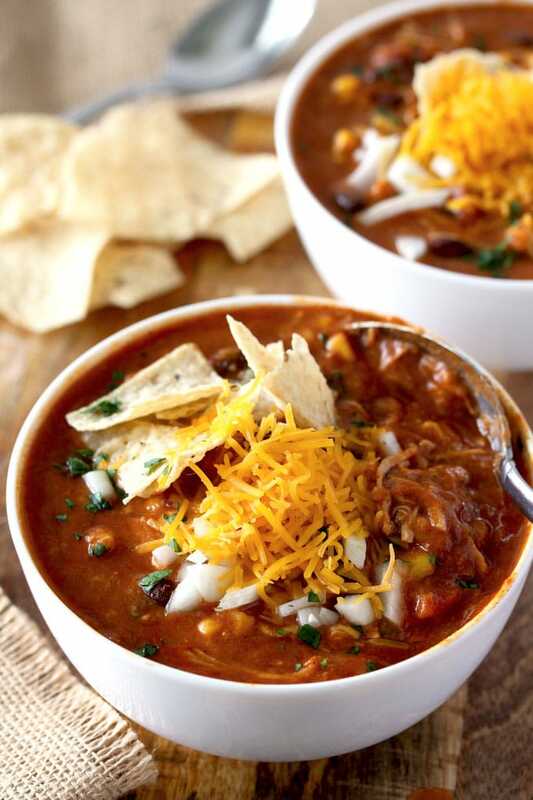 WANT TO TRY THIS CHICKEN ENCHILADA SOUP? PIN IT TO YOUR SOUP OR CROCK POT BOARD!! Shredded cheese, tortilla chips, chopped onions, sour cream, chopped cilantro. In a medium bowl, whisk the masa harina with 2 cups of water until well combined making sure you don't have any lumps. Set aside. 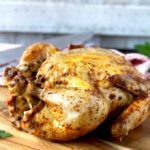 Place the chicken breast at the bottom of the slow cooker. Sprinkle the chili powder, cumin, salt and pepper over the chicken breast. Add the onions, garlic, enchilada sauce, stewed tomatoes, chicken stock, the masa harina mixture, black beans and corn to the slow cooker. Stir, cover and cook on LOW for 6 - 8 hours or on HIGH for 4 hours. Remove the lid and shred the chicken with two forks. Add the cheese and mix well until all the cheese has melted. Check for seasoning. Add chopped cilantro (optional) and mix well. * Get the mild enchilada sauce unless you can handle "fuego" type heat. **Use Mexican recipe stewed tomatoes, if available. Otherwise original recipe is fine. If you can't find stewed tomatoes you can use crushed tomatoes instead. Nutrition information provided is an estimate and will vary depending on the brand of ingredients used. This looks so flavorful and yummy. And I love that it’s made in the slow cooker! 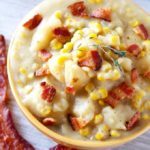 Im so ready for fall and comfort food like this with so many great flavors in it! Definitely making this asap!! OMG yum! Chicken enchilada soup sounds so amazing! 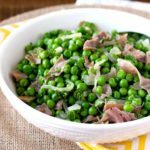 I need to try making this for dinner soon! Ooooh, great idea to use masa as a thickener and how nice that this can be cooking while I’m at work! We’re going to enjoy this one! Oh wow, I definitely need to make this soup!! 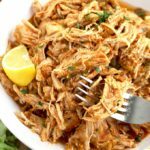 I love slow cooker recipes especially when they have this much flavor going on! I do love that soup at Chilis and now I can make it at home, what a delicious meal! 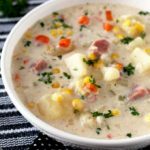 This soup is one that my family would absolutely love! 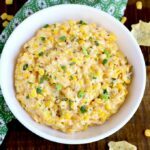 I also love how easy it is to prepare, it’s perfect for a busy weeknight! Yes! perfect for busy times! This has my name written ALL over it! I love easy soups like this — this is happening PRONTO! Do you drain and rinse the black beans? Hi Carisa, as a rule I only rinse canned beans for salads or things like dips (because I don’t want the extra liquid). For soups I don’t even bother draining them. The liquid tastes just like beans!!! That is a personal preference but honestly I don’t bother with it. Hope that helps!! Hi! Was thinking of making some taco seasoning and adding this to the crockpot instead of the individual spices… How much would you recommend? Hi Brittany, You can always add more at the end so start with less and go from there. Maybe 1 tablespoon? assuming it doesn’t contained salt.